Rich domain experience and enthusiasm of professionals has aided our firm to offer a quality assorted array of Cooking Mixer. Cosmos Cook-wok’ s effective sauting method aided by its unique mixing tool and technology makes large volume cooking very easy. A cooking mixer with a painted Body, SS Stove with Auto Igniter & SS 304 Single Layer Bowl, Lid & Mixing Arm with SS Planetary Head Assembly, Cook-wok is the ultimate cooking machine. 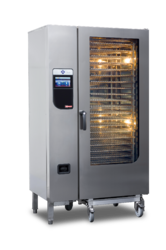 With thorough knowledge and understanding of the industry, we are engaged in manufacturing and exporting a wide gamut of Commercial Combi Oven. All these steamers are the multipurpose cooking equipments that are widely used for steaming roasting, grilling and preparation of dum biryani and bakery products. The series of Commercial Combi Oveneamer is technologically advanced and helps in retaining proper nutrition in the food during cooking process. Cosmos Cook Wok Cooking Mixer effective sauting method aided by its unique mixing tool and technology makes large volume cooking very easy. With a painted Body, SS Stove with Auto Igniter & SS 304 Single Layer Bowl, Lid & Mixing Arm with SS Planetary Head Assembly, Cooking Mixer (Cook-wok) is the ultimate cooking machine. Manual Tilting Cosmos Cooking Mixer effective sauting method aided by its unique mixing tool and technology makes large volume cooking very easy. With a painted Body, SS Stove with Auto Igniter & SS 304 Single Layer Bowl, Lid & Mixing Arm with SS Planetary Head Assembly, Cooking Mixer (Cook-wok) is the ultimate cooking machine. Capacities: Capacities available are 50, 80, 150, 200, 250,300,400 & 500 lit. 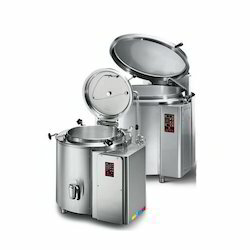 Steam jacketed Kettle is designed to cook curries and gravies and many more. Cooking Kettle jacketed boiling pan fitted with a Mixer for even cooking results. Cooking Kettle has the Mixer has an adjustable speed control with reverse mode. Cooking Kettle has the machine comes with time & temperature control and recipe programmable control panel. Commercial Stem Boiling Pan is designed to cook curries and gravies and many more. Cooking Kettle jacketed boiling pan fitted with a Mixer for even cooking results. Cooking Kettle has the Mixer has an adjustable speed control with reverse mode. Cooking Kettle has the machine comes with time & temperature control and recipe programmable control panel. Hydraulic Tilting Cooking Mixer effective sauting method aided by its unique mixing tool and technology makes large volume cooking very easy. With a painted Body, SS Stove with Auto Igniter & SS 304 Single Layer Bowl, Lid & Mixing Arm with SS Planetary Head Assembly, Cooking Mixer (Cook-wok) is the ultimate cooking machine. We are offering Steam Boiling Pan to our clients. Tilting Cooking Mixer effective sauting method aided by its unique mixing tool and technology makes large volume cooking very easy. With a painted Body, SS Stove with Auto Igniter & SS 304 Single Layer Bowl, Lid & Mixing Arm with SS Planetary Head Assembly, Cooking Mixer (Cook-wok) is the ultimate cooking machine. Capacity 100 to 500 Litres. Cosmos Tilting Paste Kettle is designed to cook curries and gravies and many more. Cooking Kettle jacketed boiling pan fitted with a Mixer for even cooking results. Cooking Kettle has the Mixer has an adjustable speed control with reverse mode. Cooking Kettle has the machine comes with time & temperature control and recipe programmable control panel. Cooking Tilting Kettle is designed to cook curries and gravies and many more. Cooking Tilting Kettle jacketed boiling pan fitted with a Mixer for even cooking results. Cooking Kettle has the Mixer has an adjustable speed control with reverse mode. Cooking Kettle has the machine comes with time & temperature control and recipe programmable control panel. Cosmos Food Mixer (Cook-wok' s) effective sauting method aided by its unique mixing tool and technology makes large volume cooking very easy. With a painted Body, SS Stove with Auto Igniter & SS 304 Single Layer Bowl, Lid & Mixing Arm with SS Planetary Head Assembly, Cooking Mixer (Cook-wok) is the ultimate cooking mixer machine. Cosmos Tilting Cooking Kettle is designed to cook curries and gravies and many more. Cooking Kettle jacketed boiling pan fitted with a Mixer for even cooking results. Cooking Kettle has the Mixer has an adjustable speed control with reverse mode. Cooking Kettle has the machine comes with time & temperature control and recipe programmable control panel. Ever since our inception, we have been fruitfully engaged in manufacturing and supplying a large stock of Commercial Boiling Pan. These pans are indirect water heating equipments that are integrated with double water jacketed frames. Our pans are extensively used in many commercial kitchens for bulk boiling of milk, rice pulses, pulses and vegetables. Before foal dispatch, we duly inspect the line of Commercial Boiling Pan on the basis of durability and functionality. Boiling pan are double water jacketed indirect heating equipment for bulk boiling. 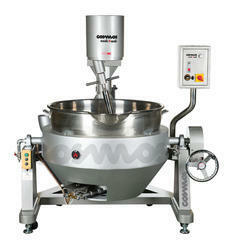 Applications vary from milk boiling, steaming vegetables, rice and pulses to milk product. we are providing to them the array of Commercial Cooking Kettle. These kettles are completely programmable and well integrated with mixing arms. Electrically operated, our kettles are considered as the ideal equipments for commercial kitchens. Mostly used in restaurants, hotels and canteens, the series of Commercial Cooking Kettle is used for preparing goulash, frying, rice, biryani and curries. We are offering Boiling Pan with Stirrer to our clients. We are offering Cooking Kettle with Stirrer to our clients.